These sources were used in the writing of GURPS Crusades. Baigent, Michael; Leigh, Richard; and Lincoln, Henry. Holy Blood, Holy Grail (Delacorte Press, 1982). A theory that the Templars survive into the modern day, guarding a secret that could rock the Church to its core. Bartlett, W. B. God Wills It! An Illustrated History of the Crusades (Sutton, 1999). A solid history of the Crusades from the Battle of Manzikert through the fall of Acre in 1291. Excellent detail; well written. Billings, Malcolm. 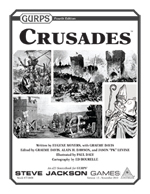 The Crusades: Five Centuries of Holy War (Sterling, 1996). Well-written, with good coverage of later crusading in the Mediterranean and Asia Minor. Bray, R. S. Armies of Pestilence: The Impact of Disease on History (Barnes & Noble Books, 2000). A look at the impact of plagues on the Crusades and other historical events. Brown, Dan. The Da Vinci Code (Doubleday, 2003). This best-selling novel explores the possibilities set forth in Holy Blood, Holy Grail – so closely that its authors sued Brown for plagiarism. The book contains more detail than the movie. Clifton, Chas S. Encyclopedia of Heresies and Heretics (Barnes & Noble Books, 1998). This book includes detailed coverage of the Cathar heresy, which was wiped out in the Albigensian Crusade. Daraul, Arkon. Secret Societies: A History (MJF Books, 1989). Includes chapters on the Assassins and the Templars. Duggan, Alfred. Lord Geoffrey's Fancy (Phoenix Press, 2007). This historical novel traces the experiences of an English knight seeking his fortune in Outremer. Duggan's The Lady for Ransom (Phoenix Press, 2007) is set in Byzantium at the dawn of the Crusades. And his Count Bohemond (Phoenix Press, 2007) is a fictionalized account of the life of Bohemund, the first Latin King of Antioch. Gabrieli, Francesco. Arab Historians of the Crusades (Barnes & Noble Books, 1993). A look at the Crusades from the Muslim point of view. Heckethorn, Charles W. The Secret Societies of All Ages and Countries (Cosimo Classics, 2005). Two volumes (the second is here). A reprint of an 1875 book with information on the Assassins and the Templars. Howard, Robert E. Lord of Samarcand and Other Adventure Tales of the Old Orient (Bison Books, 2005). The creator of Conan wrote many historical action tales, some set in Outremer; this is a collection of the best. Lane-Poole, Stanley. Saladin and the Fall of Jerusalem (Greenhill Books, 2002). Good biography and chronicle of Saladin's campaigns in the Holy Lands and Egypt. Good charts on the rulers of the various Crusader kingdoms. Lewis, Bernard. The Assassins: A Radical Sect of Islam (Basic Books, 1968). A good history of the Ismaili and Assassin sects, with useful information on Muslim religious divisions. Logan, Donald F. A History of the Church in the Middle Ages (Routledge, 2002). This detailed history of the medieval papacy provides background information on papal motivations and politics of the Crusades as well as many useful maps. Miller, David. Brassey's Book of the Crusades (Brassey's, 2001). A good general reference with chapters on weapons, siege warfare, and the military orders. Nicholson, Helen. The Knights Hospitaller (Boydell, 2001). A detailed history of the Knights Hospitaller, including their background, finances, and organization. The second half of the book deals with the Hospitallers' history after the Crusades. Nicolle, David. 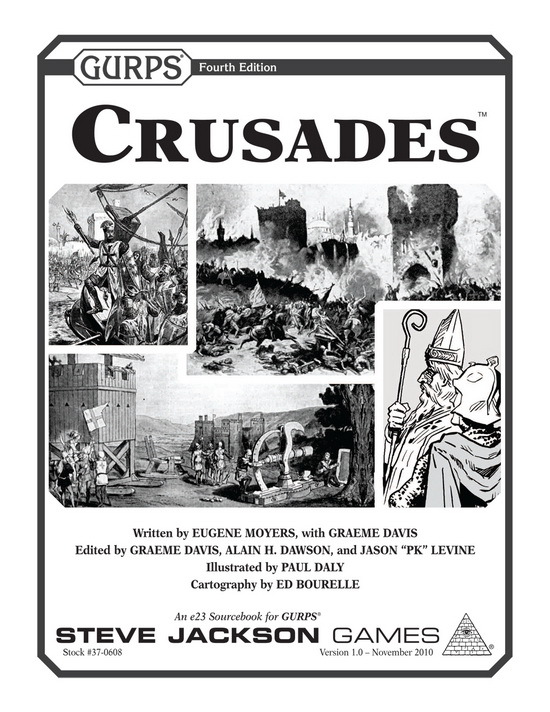 The Crusades (Osprey, 2001). Part of the Essential Histories series, this book offers a light overview of the Crusades but is useful for its excellent photos and color maps, along with several significant short biographies. Nicolle, David. The Crusades (Osprey, 1988). Part of the Elite series. This book presents hard information on warfare, sieges, and weapons, with the usual excellent color illustrations of soldiers and their equipment. Nicolle, David. Knight of Outremer (Osprey, 1996). Part of the Warrior series. A detailed treatment of Crusader arms, armor, equipment, and tactics, with good sections on pay, training, society, and heraldry. The illustrations are excellent, as expected of an Osprey publication. Nicolle, David. Saladin and the Saracens (Osprey, 1986). A detailed illustrated reference on Muslim arms, armor, and tactics. Read, Piers-Paul. The Templars (St. Martin's Press, 1999). An authoritative history of the Templars up to their dissolution in 1314. Riley-Smith, Jonathan. The Crusades (Yale University, 1987). A detailed history of the crusading movement up through the Renaissance and Reformation, with excellent background material on the participants, crusading theory, trends, and politics. Wasserman, James. The Templars and the Assassins (Inner Traditions International, 2001). The first part of the book gives historical information on Templar and Assassin activity in the Holy Lands, and the latter part is given over to conspiracy theories. Williams, Paul L. The Complete Idiot's Guide to the Crusades (Alpha Books, Pearson Education Inc., 2002). An easy-to-read volume on the history and background of the Crusades. Part of the well known Idiot's Guide series, its main drawbacks are its casual writing style and a shortage of dates in the historical section. There are surprisingly few films based on the Crusades. Perhaps Hollywood should take note. The Crusades (Cecil B. DeMille, 1935). Directed by Cecil B. DeMille, with medieval historian Harold Lamb as technical adviser and a literal "cast of thousands," this could have been a great movie but falls short. It suffers from very muddled history and carries a heavy-handed "peace" message, probably due to the isolationist sentiment of the 1930s in America. Saladin (Youssef Chahine, 1961). Distributed by Lotus Films, an Egyptian company, this movie is a mix of confused history and rather heavy-handed Islamic propaganda. This film is heavily influenced by the Egyptian Nasser regime of the time. El Cid (Anthony Mann, 1961). Distributed by Allied Artists, this is actually a Spanish production starring Charlton Heston. Filmed in Spain with actual walled cities and castles, it is a wonderful visual record of medieval settings. Thousands of extras and larger-than-life special effects (including eight full-size siege towers) make it a joy to watch, although it is based on a very romantic vision of Spain's greatest medieval hero. It is not set in the Holy Lands, but it shows the Spanish Reconquista that was being fought simultaneously with the Crusades. Crew and vehicles are seen in a couple of shots. Kingdom of Heaven (Ridley Scott, 2005). This Ridley Scott epic boasts an all-star cast and a sweeping storyline about a French village blacksmith (Orlando Bloom) who travels to defend Jerusalem from Saladin and becomes involved with King Baldwin IV and the evil Reynald of Châtillon. Empires – Holy Warriors: Richard the Lionheart & Saladin (PBS Paramount, 2005). A barely adequate look at two of the major figures of the Crusades. The Crusades – Crescent & The Cross (A&E Home Video, 2005). This is the usual History Channel approach . . . a talking head here, a reenactment there.